We have some wonderful older ladies in our church who garden and one or some of them…I’m never quite sure, always share some of their garden harvest with all the people in our church. I’ll sometimes see a big bag or a box filled with zucchini, cucumbers, and tomatoes. But I never know who brings in the goods so I can never thank them! A couple of Sundays ago, when the service was over and we were all standing around talking and eating, I wandered over to the food table and found another bag of vegetables. This one, though had butternut squash in it! I couldn’t believe it! I didn’t know any of the ladies grew the squash and when I inquired about who brought the bag, several of the woman said they weren’t sure. So I grabbed one of the squashes and kept it in my pantry for about a week till I decided on a recipe to use it for. Since I’m really into our Meatless Monday’s on our menu, I decided that this butternut squash needed to star in our Monday night dinner. I finally decided on a Martha Stewart recipe, knowing that “Ms. I Can Do Everything Perfectly” wouldn’t steer me wrong. Oh boy, this recipe did not disappoint! This lasagna is amazing. If I had to give it a star rating, I would give it a 5 stars! Josh even told me, that if he had any doubts or misgivings about my meatless Mondays, I had changed all of that. That he actually looks forward to our Monday night dinners now! Um….Wow! That’s kind of a big compliment from him. I’m kind of scared. Now that he’s gifted me that compliment, what happens when the next meatless dish I make doesn’t quite reach expectations? Eeek! It certainly does give me something to strive toward…or I could just make this lasagna every Monday from here on out! What do you think? 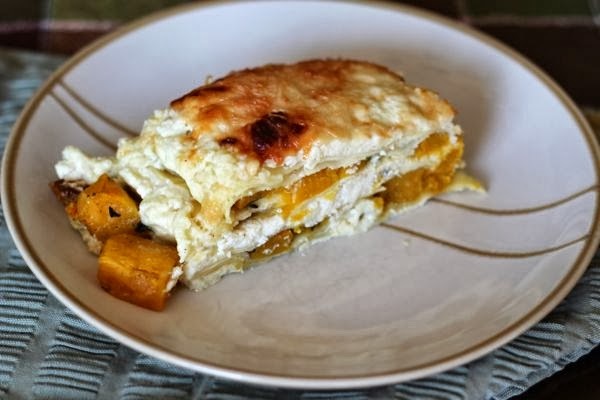 A completely decadent and rich meatless lasagna filled with buttery squash and a creamy white cheese filling. To make this lasagna go over the top, add bacon! Pre-heat oven to 425 degrees. Toss squash, oil, and 1 tsp salt on a baking sheet. Season with pepper. Bake until light gold and tender, 25-30 minutes. Let cool. Reduce oven temperature to 375 degrees. Combine ricotta, cream, yolks, mozzarella, and a pinch of nutmeg in a medium bowl. Season with salt. Melt butter in a small sauté pan over medium-high heat. As soon as it starts to sizzle, add sage, and cook until light gold and slightly crisp at edges, 3-5 minutes. Place squash in a medium bowl, and mash half of the squash with the back of a wooden spoon, leaving the other half in whole pieces. Gently stir in the sage, butter, chicken stock mixture, season with salt and pepper. Spread 3/4 cup of the ricotta mixture in the bottom of 9-cup baking dish. Top with a layer of noodles. Spread half of the butternut squash mixture over the noodles. Top with a layer of noodles. Spread 1 cup of the ricotta mixture on top of the noodles. Repeat layering once more (noodles, squash, noodles, ricotta). Sprinkle Parmesan cheese over the ricotta mixture. Place baking dish on a rimmed baking sheet and bake until cheese golden and bubbly, 30-35 minutes. Let stand for 15 minutes before slicing and serving. I have to find some butternut squash so that I can try this. It's one of my favorite butternut squash recipes to date! 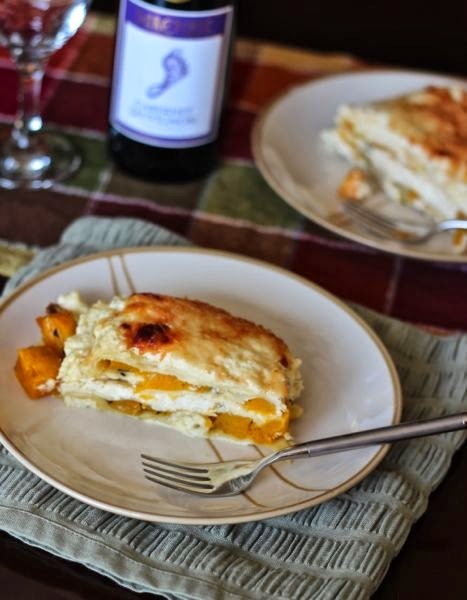 I have had a butternut squash lasagna before, but I've never made one myself. I definitely need to change that now! I guarantee, it's completely worth the work that goes into it. And the leftovers are yummy too! I'm not a huge lover of meat, so it's always nice to see that you can have a great dinner without it!! This lasagna looks awesome! You certainly don't miss the meat in this dinner. :) Thanks Jocelyn! !